It’s time to spruce up your home for holiday entertaining. It’s easy to make your home warm and inviting with the right ambient lighting. The holidays typically involve guests coming to your home, which means your outside lighting is an important element for creating a welcoming feel. A great start is general facade illumination to highlight the form of your home’s exterior and to light up dark areas near the main entrance. Landscape lighting in and around trees, shrubs and walkways is also recommended. 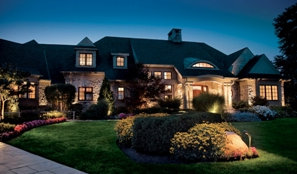 If possible, include path lighting to direct guests safely to your front door. Once inside, a central fixture in the foyer will set the mood. Be sure your lighting is not too intense, which can be uncomfortable for visitors entering from a dark exterior. Use a dimmer to control the light intensity at night and to reduce potential glare and discomfort. The color temperature of your lighting is also important to maintaining a warm, cozy feeling throughout your home. The most used and pleasant is 2700 Kelvin. It is the closets to normal, outside lighting without looking into the sun. LED light bulbs, known for energy efficiency and long life span, are also useful for creating attractive ambient lighting. Some LEDs are tunable, so you can adjust the color temperature with a built-in dial or Smartphone app. In addition, some LED products are color changeable, which can alter your home’s theme according to a particular holiday. Visit your local Hortons Home Lighting to learn more about lighting solutions to update your lighting design for the holiday season. Why are LED lights cheaper to power? LED lights are less expensive to power because they convert more electricity to light than incandescent bulbs. An incandescent bulb converts about 10 percent of the electrical power used to visible light. The rest of the power used is emitted as heat. By comparison, LEDs can convert more than 30 percent of electrical power to light, and generate little heat in the process.